Printed on cream paper with an embossed Panel design, all orders of service include inserts. Your venue, names and wedding date will be printed on the front of the order of service in your choice of ink colour and typestyle. Your hymns and readings will be personalised in black ink. 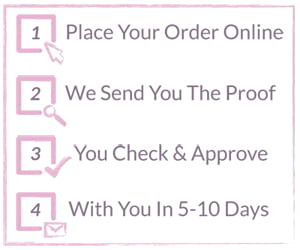 To order simply upload your wording details and we will supply an email proof free of charge. Aside from the personalised front cover/cover page, the rest of your wording will be printed in Times Europa Roman 8pt as standard.